WE HAVE A SECURED SITE. 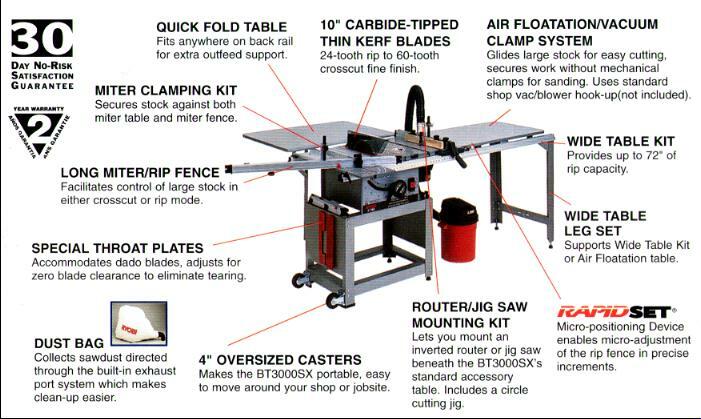 With its revolutionary design and unique features, the BT3OOOSX opens a whole new realm of woodworking possibilities. Using advanced engineering and design, the BT3OOOSX offers more features, greater precision and more versatility than any other saw. The BT3OOOSX is equipped with many features for your convenience, ease of use, and high-quality performance. Its sophisticated die-cast technology and design makes this tool tough. The powerful 4,800 RPM, 15-AMP dual belt driven motor drives the blade smoothly and efficiently. 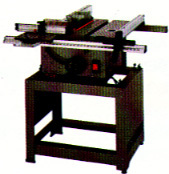 This system includes a 36-tooth thin-kerf carbide tipped blade. Oversized miter scale, cast in the table, permits pin point accuracy. An adjustable miter fence assures smooth exact cutting and enhances precision. The internal construction and exhaust port removes 75% of the sawdust without the use of a vacuum system. It is lightweight for portability; weighs only 107 lbs., so it's easy to move around the workshop or job site. Designed with the operator in mind, the BT3OOOSX offers features such as a see-through blade guard, anti-kickback pawls, and an oversized switch with lockable cover plate. The metal work stand, which is lightweight for portability, has convenient storage brackets to store fences when not in use. The BT3OOOSX system includes an assembly video which will guide you step-by-step through set-up and alignments. Ryobi offers a complete line of optional accessories to enhance the BT3OOOSX, creating a complete woodworking system. For more information on how to expand your system, see the back panel of this brochure or call 360-245-3429.